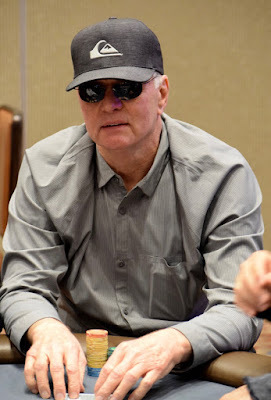 Mike Harvey (above) just ran most of his stack in to the flopped boat of Jeff Spruitenberg ... and 'round these parts Boat Don't Lie. The rest of Mike's stack faded away the next hand, and off he goes to the registration cage to use his one available re-entry in Day 1B of the $500,000 Guarantee WPTDeepStacks Main Event. No matter whether Mike bags a stack tonight, he's definitely playing tomorrow's final starting flight, for he likes the Best Stack Forward option.